Most of the adventurers are deliberately archetypal animé heroic fantasy characters. Which I think is handy to have available and makes for short profiles. Known Relatives: Two older sisters (names unrevealed). Height: 5’2″ Weight: 90 lbs. Eyes: Greyish dark blue Hair: Brownish red. 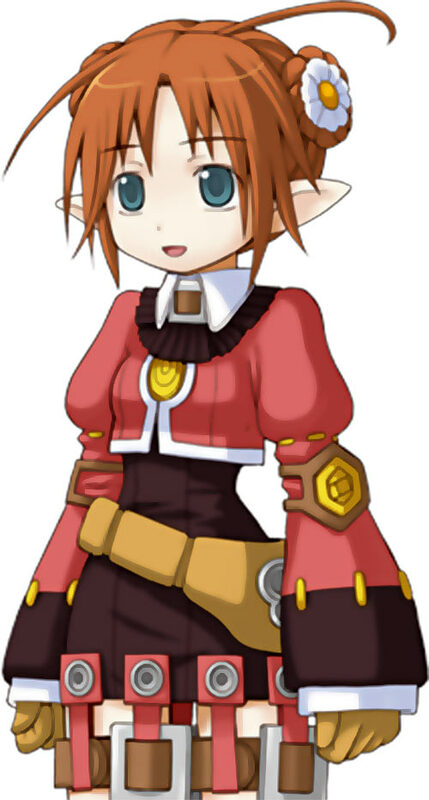 Recettear names notes: In the original games she is named “Tiers”. This was intended to mean “the third” to refer to her status as a third child, but is a slight mistake – “tiers” means “third” as in “a third”, not as in “the third” (that would be troisième). In the English translation this is rendered “Tielle” to match the Japanese pronunciation of the French “Tiers” (the “s” is silent). A name in correct French could be “Tierce” (Tyeah-rhss), a now-infrequent word used for certain series of 3 things. Tielle is reportedly a mediocre archer, by Elven standards. That suggests that Elves are amazing archers. Despite manifestly not large and strong enough to wield a warbow Tielle compares pretty well with experienced Human adventurers. Though she’s not strong enough to really draw her bow, she has a technique for making underpowered and short-ranged but still accurate shots using a partial draw. She is also capable of somehow shooting toward her side or even straight behind her, her accuracy undiminished despite the contortion and being unable to see her target. Tielle can magically focus strength in her arms, building up strength until it equals that of a much larger and stronger archer. This additional strength vanishes upon the arrow’s release, but Tielle can start building up “charge” anew right away. Somehow, she never runs out of arrows. Making her arrows burst in flames and hit with extra force. Shooting an enchanted arrow that will track an opponent like a seeking missile. Creating a small portal above herself. All the arrows she shoots up into the portal come down at a point of her choosing, except with increased force and in much greater quantities, blanketing an area in arrow fire. 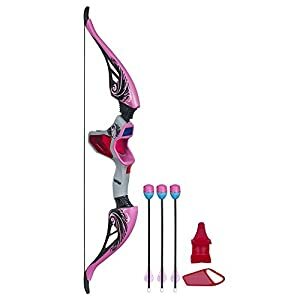 Entering a “Cuterage!” state that makes her tougher and much stronger, and able to operate her bow with the speed and power of an heroic archer like Hawkeye (Kate Bishop). 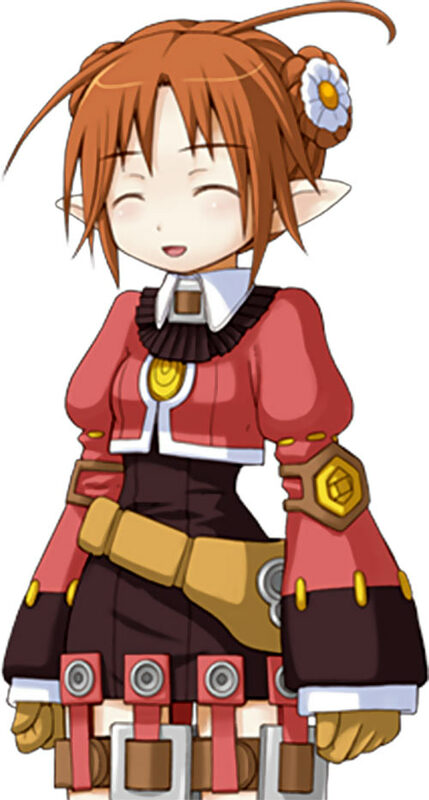 Tielle is an elf girl, who seems to be about Recette‘s age. 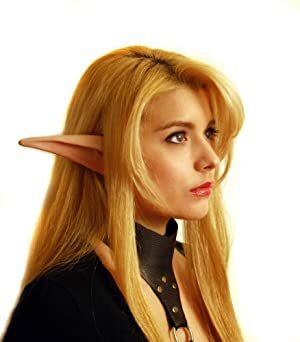 Elves and Humans seem to generally be wary of each other and keep their distances. Since it is implied that Elves have access to very powerful magics, it may mean that their population is much smaller than the Humans’. Tielle followed one of her big sisters to the Pensée area, to check on the newly-discovered dungeons there. Tielle’s sis seems to be some sort of elite soldier or adventurer – high speed, low drag. Tielle, on the other hand, was slow and unfocused by Elven standards and her sister seemed to consider her a ball-and-chain. Recette and Tear briefly met Tielle as she was trying to catch up with her fleet sister during a resupply run in Pensée. When they encountered her again, she had finally become lost as she couldn’t keep pace with her sister… deep within a deadly dungeon. Stumbling upon Recette, Tear and their hired adventurer, Tielle panicked and retreated within a sort of… warehouse ? crewed by gnolls, shooting her bow to deter pursuit. The adventurer eventually managed to stop her, but little Tielle was badly wounded in the process. At this point a treasure chest popped up, holding a dose of an extremely potent Elven medicine. Though that added credence to Tear’s theory that dungeons were alive and sapient , the greedy fairy was mostly busy estimating for how big a fortune this medicine could be sold. Recette, however, chose to use the medicine to cure Tielle. She then took the Elf to her house to finish nursing her back to health. This great demonstration of generosity convinced Tielle that Recette meant her no harm. Tielle stuck around in Pensée after finding a letter from her sister at the Adventurer’s Guild. Tielle’s sis had finished her mission and returned home, not bothering to stick around to recover Tielle. She told her to keep training in the local dungeons so maybe one day Tielle would cut it as an archer. Tielle became an accredited adventurer, though her main goal was to sample sweet culinary specialities throughout Pensée. Oddly enough Tielle had Ye Olde Treasure Mappe, though somehow her ancient document about hidden wonders was a guide to Pensée’s best confectionery boutiques and their specialities. As she devoured all sorts of sophisticated sugary specialities, Tielle came to regularly work with Recette as a dungeon explorer. Tielle is ridiculously obsessed with sweets and confectionery. Her main goal in life is to eat all the best ones. She tends to forget everything when she’s busy coveting some renowned pastry chef’s product – such as, say, being an isolated Elf in a Human town. One gets the impression that sweets are chiefly a Human specialty, and that Elves who are not Tielle consider that eating those make you slow and stupid. Thus, while Tielle was initially very wary of “Human-persons”, she soon let her guard down so she could explore all the boulangeries-pâtisseries in town. Beyond that Tielle seems to be a typical kawaii-and-zany animé girl – and to be roughly as dumb as Recette, who shares her obsession with “yummy things”. She’s very much not an observant, deductive or disciplined person. Enchantment has No Range, and can only raise Tielle’s STR for the purpose of shooting a bow. Enchantment is gradual. It is activated with a Dice Action, but this provides no immediate benefit. On the next Phase one AP engages (at no Action cost), and on the following Phase the second AP engages. Enchantment shuts down as soon as she takes a bow shot, and needs to be reactivated as above. Full vision only to shoot arrows at things she cannot see (usually because they are behind her). Occultist (Rituals) only with Rituals with which she has a Familiarity. Language (Presumably an Elven language), Lightning Reflexes, Misc. : Tielle is registered with the Adventurers’ Guild, Misc. : when using a bow Tielle does not apply the normal Recommended Strength rules – instead each missing AP of STR reduces her EV and Range by 1. Misc. : Tielle is an Elf, so Humans are probably wary about her, Misc. : Tielle’s body mass is 1 AP. Elf bow [BODY 04, Projectile weapon: 04, Ammo: 01, Recommended STR: 04, R#02, Bow Advantage, Limitation : Low Penetration]. Elf leather armour [BODY 04, Damage capacity: 02]. Effect: Dimension Travel (Summoning): 01. Modifiers: Can only be used to summon a quiverful of arrows. Modifiers: Can only be cast on a pair of arrows, with the second arrow being consumed when the Ritual activates. A target hit by the arrow is attacked both by the arrow and Flame Being, and Flame Being confers the Scattershot Advantage as well. Modifiers: Can only be used to summon a missile with the following stats – [BODY 02, EV 05, AV 04, Flight: 06, R#02, Grenade drawback, Limitation : Flight can only be sustained for five Phases (-2)]. Modifiers: Projectile Weapons is Indirect and has a 2 APs Area of Effect. Casting time: None, but Tielle will usually takes extra time to lower the difficulty of the Ritual. Modifiers: The first 2 APs can only be applied to Tielle’s STR, and do not stack with any other Enchantment. The third AP can only increase her BODY. The last APs endows Tielle with the Lightning Release Schtick. Components: 5 arrows, and Tielle will usually burn HPs to increase her chances of landing her Ritual. You’ll probably want to check the Archery Rules article first, as well as the Recommended Strength rules if you’re not familiar with these. In Recettear her target-seeking arrows are usually used against flying opponents, which wouldn’t require any special DCH mechanic (shooting arrows at flying stuff is normal). I’ve kept the concept though since it’s no used *solely* for this. The flame arrows have been changed from a piercing attack to a small AoE one for simplicity’s sake. The “Arrows are forever” Ritual is just whimsy to represent her unlimited ammo. And in turn, using arrows as Ritual Components creates a loose equivalent of Spell Points. 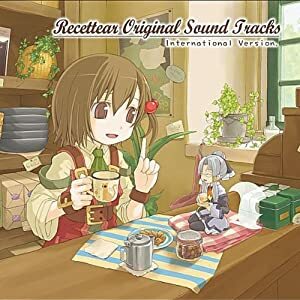 Source of Character: Recettear video game. Tielle voiced by Nanako Suzuki. Writeup completed on the 5th of April, 2016.